Phagocytosis of bacteria. False-colour transmiss- ion electron micrograph (TEM) of a macrophage which has engulfed (phagocytosed) a large number of bacteria. 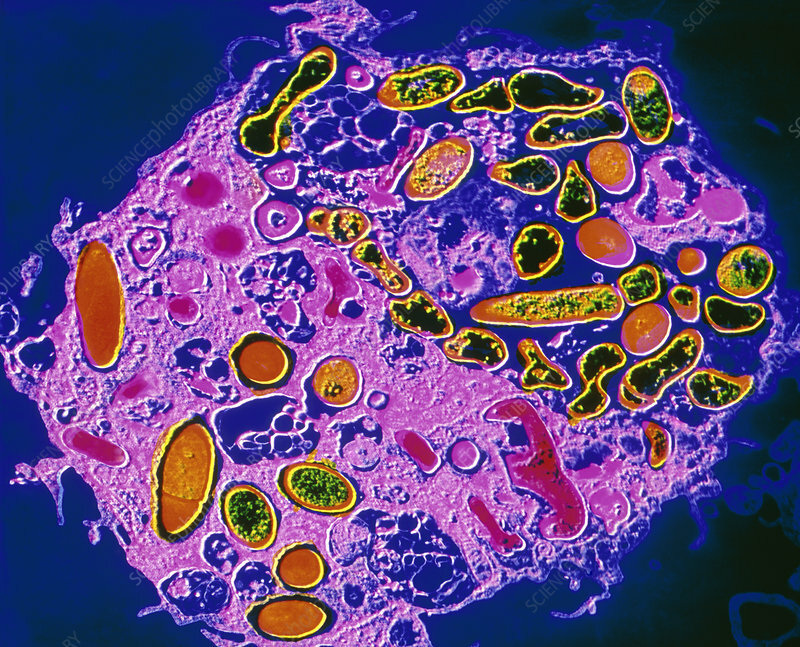 Bacteria being digested appear as the numerous orange & green ovoid bodies inside the macrophage. Macrophages are scavenger cells which attack bacteria & other microbes. They are concentrated at various sites, notably the lung, liver, spleen & lymph nodes. Pseudopods extend around the microbe & engulf it in a vacuole, the phagosome, prior to its exposure to microbicides released from granules inside the cell. Magnification: x1400 at 6x7cm size.